Have you ever wanted to say something to someone but you just couldn't find the right words? I am usually a "speak now, think later" kind of person (which sometimes gets me into trouble) but I too struggle with choosing my words wisely. How do I say this so that it's not hurtful? How do I make sure I am not making the person confused? How do I tell the truth in love? Sound familiar? 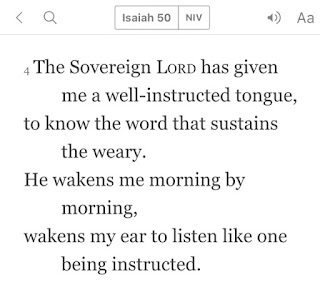 Isaiah 50:4 talks about the "well-instructed tongue", some translations refer to it as "the tongue of the learned." The text also lets us to know that this tongue is given by the Lord, so it's not something that we are necessarily born with. However, because God will not withhold anything good from us (Psalm 84:11), we can ask God to give us this gift. To have an instructed tongue is to be able to speak in confidence and love with the guidance of God's spirit. In fact, this scripture tells us that the person who has an instructed tongue will be able to speak a word to someone who is weary and help them not to give up! Whew! Now, that's powerful! I know they taught us that "sticks and stones may break our bones, but words will never hurt us" but that was the biggest lie ever. Words are powerful. Words hurt. So, we can not be careless with what we say. We all need an instructed tongue to speak effectively to our spouses, our children, our co-workers, and even strangers. The instructed tongue not only helps us with what to say but it also helps us to know when to be quiet. Well, ya'll keep praying for me because I haven't learned that yet. Don't judge me...Lol! Our prayer: Lord, today we ask you for an instructed tongue. We want our words to heal and not hurt. We want your spirit to give us the courage to speak the truth in love and to speak wisely. We want to speak with boldness and confidence. Forgive us for ever being reckless with our words. Help us to know what to speak to those who are weary and to those who are lost. We ask this in the name of Jesus, Amen.